By half time, it looked like it was all over for Carlton. Another good year for them, but on the day, Collingwood had them outmatched. 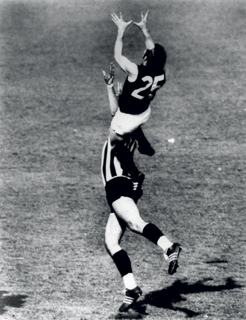 Minutes before the end of the second quarter, Jesaulenko marked over Jenkin (in what would become one of the game’s most iconic images), but it availed the Blues little. When the second quarter siren sounded, Carlton trailed by 44 points, an all-but insurmountable lead. The half-time oration by Ron Barassi, with its legendary injunction to handball, has also become legend. Carlton changed their style of play in the game’s second half, to a faster, looser style of play that depended more on handballing than kicking to move the ball forward. Carlton kicked 8 goals to Collingwood’s 3 in the third quarter, and even though they entered the final term trailing by about three goals, the momentum had decisively shifted in their direction. They won the game by only 10 points, but a narrow win is still a win. Tagged 1970, Alex Jesaulenko, Carlton, Collingwood, Graeme Jenkin, Jerker Jenkin, Jezza, Sep 26, The Back Upon Which Jezza Jumped, This Is Serious Mum, TISM, VFL Grand Final, Victorian Football League.